The 18th century was a wealth of knowledge, exploration and rapidly growing technology and expanding record-keeping made possible by advances in the printing press. In its determination to preserve the century of revolution, Gale initiated a revolution of its own: digitization of epic proportions to preserve these invaluable works in the largest archive of its kind. 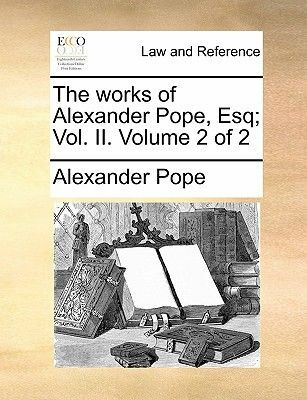 Now for the first time these high-quality digital copies of original 18th century manuscripts are available in print, making them highly accessible to libraries, undergraduate students, and independent scholars.This collection reveals the history of English common law and Empire law in a vastly changing world of British expansion. Dominating the legal field is the Commentaries of the Law of England by Sir William Blackstone, which first appeared in 1765. Reference works such as almanacs and catalogues continue to educate us by revealing the day-to-day workings of society.++++The below data was compiled from various identification fields in the bibliographic record of this title. This data is provided as an additional tool in helping to insure edition identification: ++++British LibraryT005399With a half-title, the verso of which bears an advertisement for the 'Dunciad'. Titlepage in red and black.London: printed for L. Gilliver, 1735.! 8],58,! 6],96,! 3],110-170p. ; 8.